Krill Oil Capsules SUPERBA 60 pcs. Product information "Krill Oil Capsules SUPERBA 60 pcs." 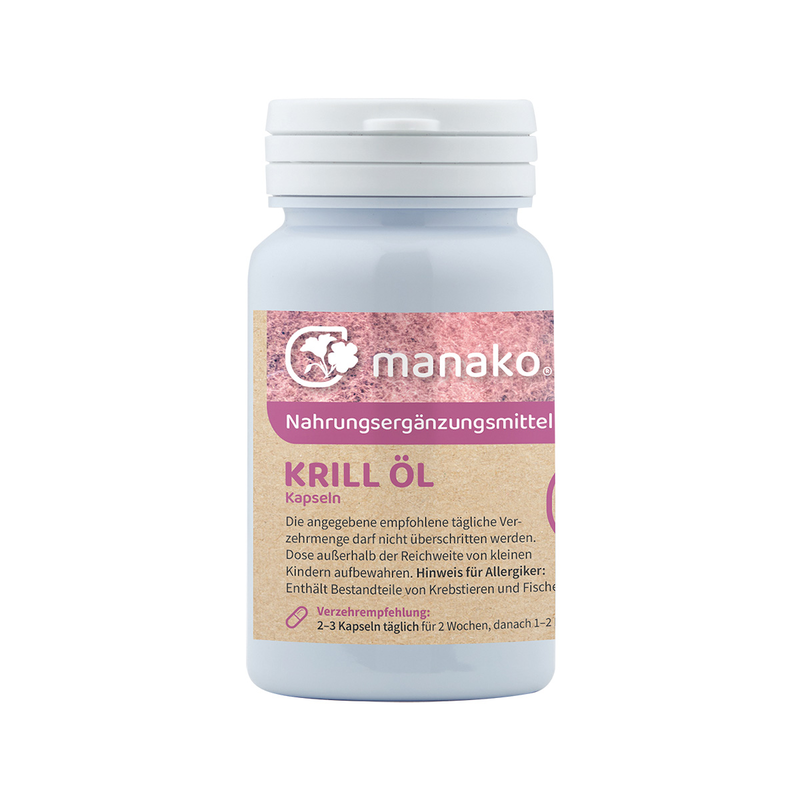 Manako ® Krill Oil capsules contain one of the best sources of Omega-3 fatty acids. The small crustaceans from the Antarctic range at the bottom oft he food chain. Krill oil contains an considerable amount of the antioxidant astaxanthin (110mg/kg) and therefore offers numerous applications. In comparison to the "conventional" fish oil, krill oil is highly economical to apply. The fatty acids of the manako ® Omega-3 Krill Oil are predominantly naturally occuring. This is why Krill oil is particularly easy to digest. It mixes smoothly with the gastric liquid and does not create an unpleasant aftertaste or regurgitation. The name "Krill" comes from the Norwegian and means: "whale food". The Antarctic krill (Euphausia superba) is a species from the familiy of the Euphausiidae (Krill), who lives in antarctic waters. Krill ranges amongst the shrimp-like invertebrates animals, which lives in large swarms. They feed on plankton, and most krill are about approx. 6 cm long and weigh up to 2 gr. They are the main food source of all bigger animals in the Antarctic (e.g. whales and seals).They are basically the energiser in the antarctic ecosystem. Benefit from this positive energy for yourself, too! 2 - 3 capsules daily for 2 weeks. Subsequently 1 - 2 capsules daily. Ingredients per capsule: 500 mg Krill oil from Antarctic Krill, slightly flavoured with vanilla. Salmon Oil Capsules 150 pcs.